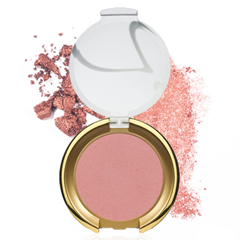 Create beautiful, flushed cheeks with Jane Iredale PurePressed Blush. Colours so subtle and natural you'll look like you're glowing from the inside out! Free of chemical dyes and potentially irritating ingredients. Suitable for use on the eyes and lips. Use a brush to apply. Rock the brush underneath the outer part of the cheekbone using one of Jane Iredale's bronzers. Brush it up onto the cheekbone. Harmonise blush and lip color. It gives a natural, pulled-together look. Mica, Boron Nitride, Dimethicone, Pine Bark Extract, Pomegranate Extract. May Contain: Titanium Dioxide, Iron Oxides, Carmine, Manganese Violet, Ultramarines.